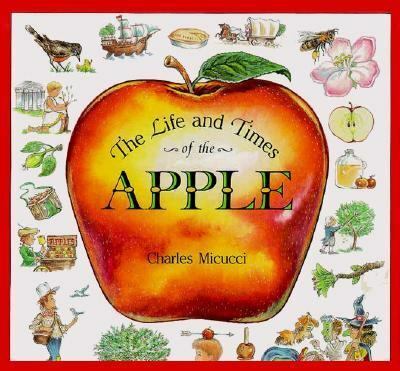 We've been reading slowly through Charles Micucci's The Life and Times of the Apple, this week. It's a nonfiction, picture book, that is good for younger, and older children to enjoy together. Covering topics from the biology, and life cycle of an apple, to geography, history (with an old earth perspective, mind you), folklore, and uses of the apple, there is something new to learn on every page. Each topic is presented in a two page format. The first page contains a short paragraph, or two, which younger children should enjoy along with the lively illustrations. The second pages go into greater detail, such as labeling the parts of an apple blossom, mapping and graphing apple growth around the world, charting cross-fertilization of apples, or illustrating the step by step process of grafting. There's a fantastic amount of knowledge contained in the short 32 pages. Did you know, for instance, there are almost 10,000 kinds of apples known, and grown around the world? That's certainly more than we normally see represented at our local grocery store. While we discussed the varieties of apples illustrated in The Life and Time of the Apple, and in a few of the other books we've been reading this week, I traced out a few apple shapes, for the girls to color in, and cut out. ...for some impromptu spelling practice. For more story themed arts and craft extensions for children, be sure to check out the stART (story + ART) link-up, over at A Mommy's Adventures, which has been on summer hiatus, but will be stARTing back up this fall (excuse the pun - I just couldn't resist). And, although the project above is not a geography or history project, Micucci's book contains enough maps, time-lines, and historical tidbits, to link it into the Geography and History link-up at All Things Beautiful. Oh, I LOVE this. The letter apples are so cute and I love that you used the apple seeds. I never would have thought of that. We had an apple taste testing one time with one of each of the varieties we found at the store. That was a lot of fun...there are so many! Thanks for sharing this craft and book with us. I love this! The book sound very interesting, and leave it to you to come up with a wonderful craft and game to go with it. I love the idea you used seeds from your apples to make the letters. I wouldn't have that many apples anymore to even think of that. I love that you used apple seeds to form the letters!!! I'll have to do this. This is wonderful. I think my son would like to make the letters of his name! :) We did apples too this week. Tis the season, I guess. This looks like a great project. I'm going to look for the book at our library. It sounds like a great book for varying ages. The book sounds fascinating, and the project that you did is perfect for it. I'll add the book to my Pinterest "for later"
Love the letter apples! So cute. Fantastic idea to use the seeds! !